I hope the idea of a writer who doesn’t read is as incredulous to you as it is to me. Writers have their own contribution, their own content and originality; yet their writing is an extension of their learning. A reading life figures prominently in apprehension of the writing craft and most revealingly if it is absent. Any good writer will agree that there exists a double-consciousness with them when they read. Obviously, the content is the subject and interest, but a writer reads the author just as much as the text. Reading is an incredibly rich cognitive experience for any person who does it, and everyone should read regularly. But the writer approaches the page with an extra set of eyes. The writer examines. He or she is always asking questions, taking notes, and thinking critically about style, plot, dialogue, and words, to name only a few. It’s second nature to the writer who understands how those observations greatly figure in his or her writing life. Simply put, reading comprehension strategies give acumen to writing. Technique. Of course, this one will always lead the list. I wish to write a bestseller one day like everyone else. But for me to make you think that I can do it at the snap of my fingers, well that would be to deceive you as I already would be. Writing is tough and the writing world is dominated by many market forces. Writing has to be really good to get noticed, and the only way to get really good is to study the craft. Today there are so many books and magazines on writing improvement that no one necessarily needs to sit in a class to learn its principles. Reading—reading anything—is your first step to knowing how to write. It’s like a mother tongue: You pick it up long before you ever study it in school. Basic reading allows one to identify writing techniques that bring all the elements together: style, voice, plot, backstory, dialogue, punctuation, climax, characters, and the many, many other tools. And reading good writers, like award-winning books and authors, can be an inspiring experience. But just a newspaper will do to start. Examine Motives. Ever wondered why an author did something the way it occurred? Why at the dinner party and not the private date? Shouldn’t she have informed the detective and not her lover? Writers are free to write as they please, but it doesn’t mean the way you would do it is a bad idea. The benefit is that this scrutiny gets you thinking like a writer…puts you backstage determining who-what-when-where-how. It also generates material for your next writing project. Grammar and Vocabulary. This is a biggie. When we read we see how words are used (grammar, context) and spelled, buy essay and learn proper punctuation. It will usually be an opportunity to build new vocabulary as well, which gives me opportunity to speak about that loved (and hated) D-word, the dictionary—but momentarily. You see, readers are picky and won’t hesitate to cease reading for little things—like poor grammar, misspelling, malapropism, weird usage, affectation, faulty logic, writing-as-spoken, ambiguity, overwriting, run-on sentences…so forth and so on. Readers are impatient and deserve decent quality material for their time and money. Again, reading the newspaper can shake out these kinks. Now, every writer should be a lover of words because they are our basic conveyance of meaning. The English language is very large and that benefits us with a colorfully nuanced language—so many ways of expressing ideas and concepts. Who is the writer that is not a friend of the dictionary? Each of us should own a quality dictionary (and thesaurus)—the kind that costs and is entitled either Merriam-Webster or Oxford—and use it often. I read with mine near. Only then will our writing reflect mastery of language and fuller intelligence mined out of words. Familiarity. This very word derives from a root meaning “of a household”. When writers read they familiarize themselves with the world of writing. They start building their own libraries, literally, of good books and authors. We all should love the classics and endeavor to read as many of them as we can; the same with greats like Shakespeare and Steinbeck. Yet there are also lesser known books and writers that are just as great. And this is why I add here that every writer should also fall in love with good libraries and bookstores. Improving your writing by reading is a self-investment for any person who even mildly appreciates and practices the craft. 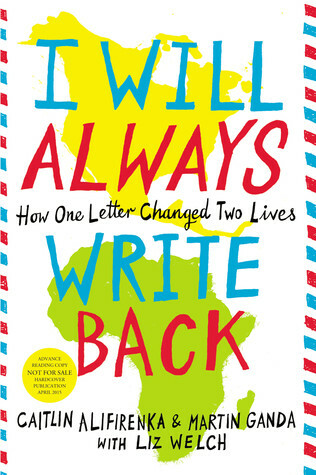 Sign into Goodreads to see if any of your friends have read I Will Always Write Back.